The "Brother/Sister Plays" by young playwright Tarell Alvin McCraney are a complex and intense "series of stories" that tell universal stories of love, loss, family, and relationships through a specific set of characters in Louisiana, who happen to be named for gods in the Yoruba mythology of Nigeria. Pretty heavy stuff, and pretty rich material too, with which Pillsbury House Theatre is doing a pretty amazing job. Last summer they presented the first play in the trilogy, In the Red and Brown Water, at the Guthrie Studio Theater. This fall they're doing the second play, The Brothers Size*, which includes two of the same characters but a different focus. I can only hope they'll complete the trilogy next year with Marcus; Or the Secret of Sweet. I'd really love to see all three done in repertoire, which would be a huge undertaking, but also hugely rewarding to see all the stories and characters within a short time period. It takes a moment to get into the language and the structure of the plays, in which characters speak their own stage directions ("Oshoosi sleeps," "Ogun exits"). But once you do you really come to know and love (or hate) these characters. In the Red and Brown Water tells the story of a young track star named Oya whose dreams are put on hold when she stays home to tend to her dying mother. It ends pretty tragically for Oya, and The Brothers Size picks up where it left off, although not with Oya**. The focus of this play is her ex-boyfriend Ogun Size and his brother Oshoosi, along with her little friend Elegba who is now grown and has befriended Oshoosi in prison. They're both out now, and Ogun is trying to get his brother back on track, giving him a job in his "carshack." Unfortunately, Elegba is there to drag him back in. This one ends pretty tragically too. Oshoosi and Elegba are best friends and share a lot in prison (just how much is only hinted at), but the truest relationship in this piece is between the brothers. Their parents died when they were young, so they've only had each other their whole lives. Elegba tells Ogun how Oshoosi cried for him when he was first imprisoned, and it's just heartbreaking. Ogun feels responsible for his brother; when Oshoosi went to prison he felt like he let him down somehow, and is determined not to let that happen again. This play features a three-person cast, much smaller than the last one, and they're all spectacular. Gavin Lawrence is a captivating actor (including a dynamic portrayal of the poet Langston Hughes earlier this year). This version of Elegba is less likeable than what I remember from the last play, but just as compelling. James A. Williams also reprises his role from In the Red and Brown Water, and is convincing as the loving but frustrated brother. Namir Smallwood is new to the trilogy but not to Pillsbury House; he appeared in Buzzer earlier this year (which will be reprised at the Guthrie Studio next year). His Oshoosi is young and playful, but with a dark undercurrent from his years in prison. You can definitely feel the strong bond of family between the brothers Size. Music is woven into this play in a really lovely way. There's a bit of singing, including a very entertaining version of "Try a Little Tenderness" by the brothers. In addition to the singing, Ahanti Young (who I've known previously as an actor, but who it turns out is also a very talented drummer) plays percussion throughout the piece, adding a soundtrack to accentuate what's happening on stage. He's playing as the audience files in before the show, which makes the pre-show waiting much more pleasant. 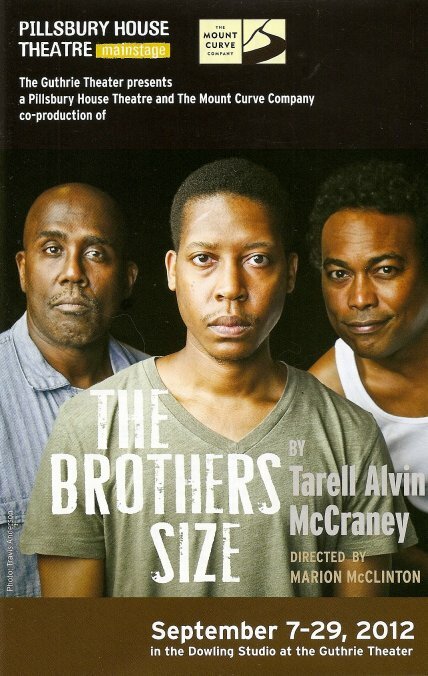 The Brothers Size is playing at the Guthrie Studio through the end of the month. If you saw In the Red and Brown Water last summer, you'll want to see this one too. But even if you didn't see it, it's certainly not necessary to appreciate this well-acted, well-written, moving, intense, and unexpectedly musical piece. *I received two complementary tickets to The Brothers Size as part of the Guthrie's "Blogger Night." **Oya was not a character in this play, but her portrayer, the lovely and talented Christiana Clark, was in the audience. I wonder if she was as upset about poor Oya's fate as I was!